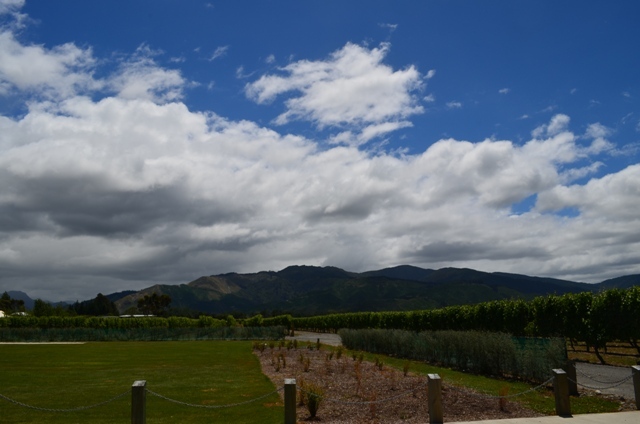 Since I was spending some days in the Marlborough region (even if most of them were on the Queen Charlotte walk), I wanted to do a winery tour. 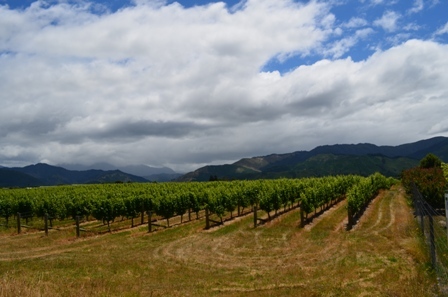 I love wine in general, New Zealand wine in particular, and the Marlborough region was one of the premier wine-producing areas in New Zealand. The question was what sort of winery tour to do, since there were many possibilities to choose from. The tour that appealed to me the most was Wine Tours by Bike. To me, it was the best of both worlds. 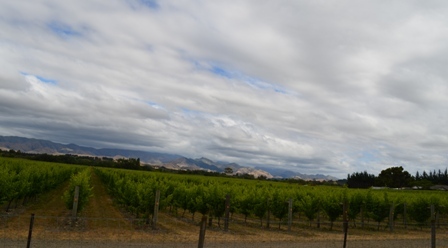 I could see as many wineries as I could fit into a five hour block of time, and it was a self-guided tour by bike. I chose the wineries, and I chose how long I stayed at each winery, and where I stopped for lunch. The tour guide picked me up from the Renwick bus station and got me set up. I set off with a bike, a winery map, and a plan. Two wineries were really close to the tour site, Forrest and Farmingham. Both of them had ample amounts of tasty wines to sample. 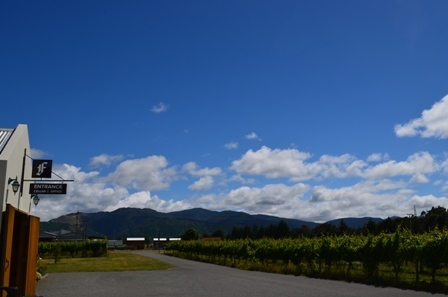 At Forrest Winery, I bought a sample of six wines of my choosing for NZ $7. I loved the Guwurtztraminer (a German-type wine I’ve found relatively common in New Zealand), and the dessert Riesling. Mindful of the fact that I didn’t want to carry bottles of wine throughout New Zealand, I bought a bottle of the smaller dessert Riesling, and I figured I would drink it before I left (I didn’t, and took it home with me to be savored later). After that, I headed to the next winery. It was kind of peaceful biking through the flat country roads surrounded by vineyards. The only thing I had to worry about was biking into the wind, since drivers seemed to be very mindful of bikers. My next winery was Framingham, where I found just as many tasty selections of wine. I was HIGHLY tempted to buy a bottle of the Select Riesling, but again, I went with the smaller dessert wine bottle to save space (I wish wineries would make smaller bottles of wine). 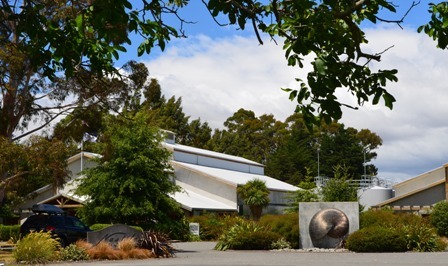 Just up the road were two wineries across the street from each other, Nautilus and Wairau, and Wairau was where I chose to have lunch. But before lunch, I had a tasting at Nautilus. It had the most extensive tasting for free. I loved the Opawa Sauvignon Blanc and the Pinot Gris, but I couldn’t fit more wine bottles in my backpack. But I did make a note of which US stores sell Nautilus wines for future reference. 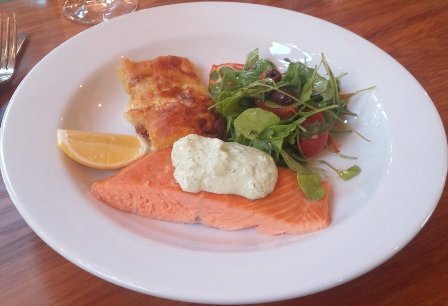 Lunch was at the Wairau River Winery across the street. 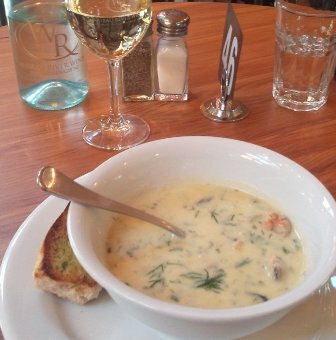 I selected an absolutely scrumptious meal of a mussel chowder starter, followed by hot smoke salmon, potato gratin and tomato and olive salad, accompanied by a glass of Reserve Sauvignon Blanc. It was completely divine. After lunch, I got on my bike and pedaled down the road to No. 1 Family Estate, who specialize in sparkling wine. I tasted three flavors- the No.1, the No.1 Rose, and the No. 8. All were tasty, but I elected not to buy. I headed to my final winery stop at Herzog Winery. It is a high-end, boutique winery specializing in expensive, organic wines. I was able to taste five wines, but not my beloved Guwurtztraminer, since they were out of it. I particularly enjoyed the Riesling, the Vigonier, and the Arneis. My absolute last stop was at Wine Village to purchase some gourmet, local olive oils for me and a gift. All in all, it was a very pleasant day. If you like wines, and like, or at least can tolerate, easy bike riding on flat roads, I HIGHLY recommend this tour. It is probably the best value for your money when it comes to wine tours. You set the pace. You set the itinerary (within established time limits), and you can try all the wine you want, and enjoy a gourmet meal at a local winery if you desire (for additional cost of course, but definitely recommended). The tour operators are very lovely and helpful people. They made some recommendations on how to have the best tour possible, and they even assisted me with my lunch reservation. They really do what they can to ensure you have a wonderful day. 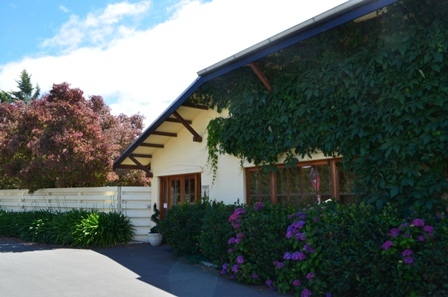 This entry was posted in Food, Travel and tagged Forrest Winery, Framingham Winery, Herzog Winery, Marlborough, Nautilus Winery, New Zealand, No. 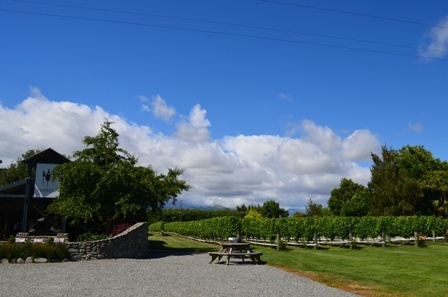 1 Family Estate Winery, Wairau Winery, Wine Tours by Bike, winery tour.